Today we are talking Cruelty Free Vegan Makeup from Sparrow Cosmetics. We LOVE giving small brands a try, because it's always fun discovering gems! Sparrow Cosmetics sent over a few shadows and highlighters for our review so lets dive into all of the details. Sparrow Cosmetics is an affordable cruelty-free makeup company. Their shadows retail for $2-3, and all highlights and blushes are $5-9. Sparrow Cosmetics came through with the savings for the brown girl crew, so you can save 15% on your order OF $20 or more with the code "SHINE". Jan Garnet is a pink shimmer shade. This shadow is very pigmented and shows up beautifully on brown skin. Feb Amethyst is a nice royal purple shimmer! It applies very easily to the lid and is so pigmented. It also has a very gorgeous reflection. I experienced a little fallout and kickback but nothing too crazy. March Aqua Marine is a gorgeous highly pigmented ice blue! Now I experienced the most fallout and kickback with this color. It was a tad bit crumbly, but I didn't have any application issues. 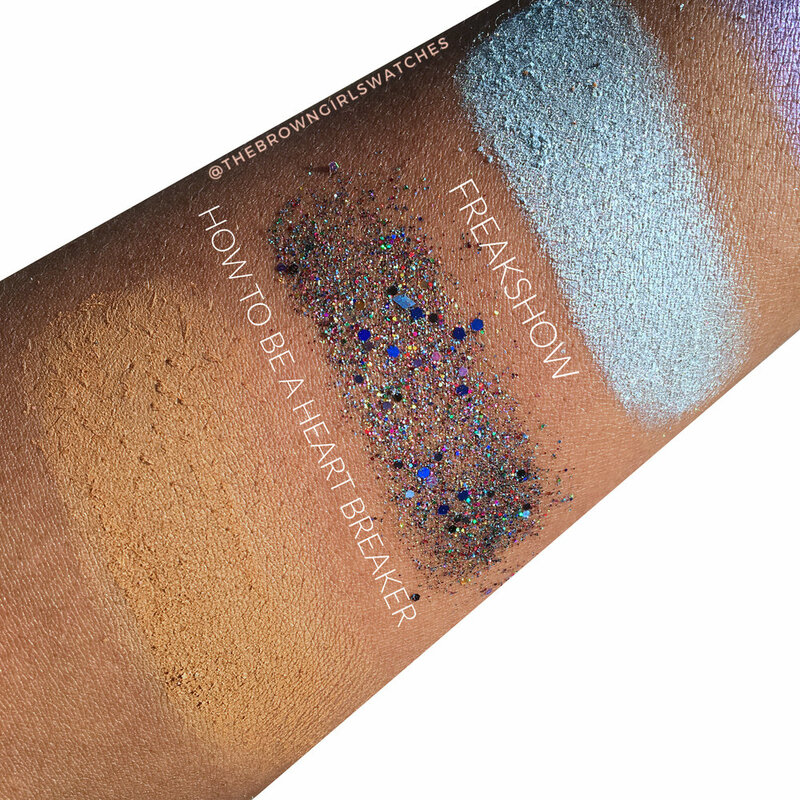 Freakshow is a very unique shade. I love how it can be applied without glue (as pictured), and I honestly would get more of these in different colors. However, I am not a fan of large glitter specs. I think this shade is a bit gaudy, but if you love glitter this would definitely work for you. How To Be a Heartbreaker is a creamy matte shade. I love how creamy the consistency is, but I did find that this color has to be BUILT UP FOR REAL FOR REAL to show on my skin tone. I was on the struggle bus, but the PLUS is that it works EXCELLENT as a transition shade. It softens out the edges of shadows flawlessly. The only con is that I did experience fallout and kickback. Showdown is a gorgeous gold highlight. I love how pigmented this color is and the pan is stunning! The glitter in this highlight is larger that I would prefer, but it still looks very flattering. Body Electric is a very unique highlight color. It's definitely serving unicorn vibes, but it's honestly not doing too much. This highlight is gorgeous and could definitely be everyday wearable. I also dislike the larger glitter specs in this highlight. Sparrow Cosmetics has some really nice products. The main con I found with the shadows is that I did experience a significant amount of fallout and kickback with the mattes and a little bit with the shimmers. However, the shadows are very blend-able and highly pigmented. The main con I found with the highlighters is the large glitter specs and fallout. I disliked the fact that when I place the highlight on the high points of my face, I would find small amounts of glitter on the rest of my face. However, I love the actual colors of the highlighters and they are so PIGMENTED. Definitely check out Sparrow Cosmetics and save that cash with the code "SHINE" when you do! LET US KNOW YOUR FAVORITE PIGMENT WE SWATCHED IN THE COMMENTS.